You don’t know me, and I know very little about you. I know you are the new director of Tate Britain, and that you officially took up the post two weeks ago. I also know you had nothing to do with this year’s Turner prize, the winner of which is announced tomorrow, and that the Artist & Empire exhibition about which I am going to say a few words represents a farewell from your predecessor, rather than a hello from you. But it is precisely because of your innocence in these matters that I am addressing you here. In the future, these will be your babies. So I’m sure you will welcome some well-meaning advice on where they went wrong. And some suggestions on how to sort it. First, though, congratulations! 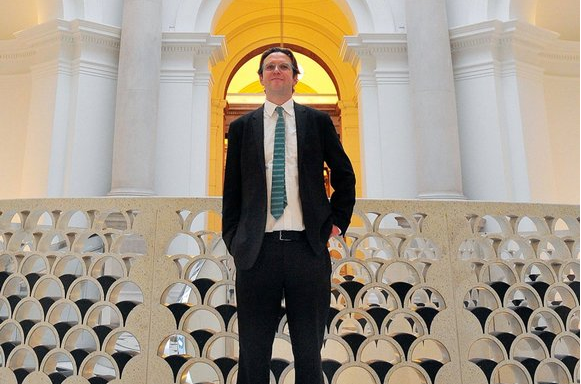 Becoming the director of Tate Britain at the age of 45 is a fabulous achievement. Your previous job as director of Nottingham Contemporary, a noisy little institution that punched above its weight, gave you the opportunity to have a powerful local impact. Now here’s a chance to enlarge that impact by running the nation’s most important museum. That’s right. I did just call Tate Britain “the nation’s most important museum”. Of course, the National Gallery, the British Museum, Tate Modern, are mighty institutions that appear, on paper, to outrank Tate Britain. But these mighty institutions could be anywhere. Put Tate Modern in an industrial warehouse with pipes and you have the Centre Pompidou. Surround the British Museum with water and you have the Pergamonmuseum, in Berlin. Tate Britain, however, could not exist somewhere else. Its job is to identify and celebrate a wonderful quality in art called Britishness. And to do that you need not only to encourage proper scholarship in the field, but to display a tangible fondness for the task. There is no point, surely, being embarrassed by the concept of Britishness, or seeking always to bash it — something of which Artist & Empire is again guilty. The handful of genuine art treasures included in the show — Stubbs’s famous painting of a cheetah; Van Dyck’s befuddled 1st Earl of Denbigh wandering through a hybrid jungle made out of bits of India, South America and Regent’s Park — are embedded in yet another dreary matrix of evening-class sociology. Britishness has given the world great art in the shape of Turner, Constable, Gainsborough, Riley, Kapoor et al. Tate Britain’s job is to understand, frame and celebrate the qualities that made that art. It’s a marvellous role, and one that requires you to feel proud of, and enchanted by, our national contribution. Love it, don’t regret it. I write all this because your predecessor’s Tate Britain always felt as if it really wanted to be Tate Modern, but was lumbered with this British thing instead. Tomorrow, Alex, when you walk into the Duveen Galleries, at the heart of your new museum, and find yourself practically alone in there, wondering why it is so empty, wave farewell to yesterday and vow not to repeat its attitudes. But wait. You won’t actually be at Tate Britain tomorrow, will you? You’ll be up in Glasgow, watching the award of the 2015 Turner prize, because that’s something else that falls into your bailiwick. Will it be the architecture practice that has nothing to do with art? Or the operatic piece that has nothing to do with art? Or the archival collection that has nothing to do with art? Tough call. Just as Tate Britain seems embarrassed by notions of Britishness, so the Turner prize has appeared increasingly embarrassed by notions of art. What a grim, joyless, un-British, sociological event it has become. “Cosseted vapidity” is one of the kinder accusations levelled by the critics at this year’s selection. Your predecessor’s decision to exclude external voices from the Turner jury and fill it solely with curators and international art professionals has erected a Berlin Wall between Tate Britain and public taste. If someone with common sense had been on the jury this year, they would have looked at Assemble, the London collective that encourages community architecture, and they would have said: “That is a London collective that encourages community architecture, not a young British artist who made a notable contribution to 2015.” But nobody said it. Why are the halls of the Duveen Galleries empty this morning? Because all the people out there who know an architectural collective when they see one know better than to go to Tate Britain to have their common sense insulted. In the real world, the two most effective and popular displays of contemporary art in Britain this year have been the poppy installation from the Tower of London and Banksy’s Dismaland, the hilarious faux theme park he created in Weston-super-Mare. What have they got in common? Neither has a hope of being shortlisted for the Turner prize. But the most important change you need to effect, Alex, is in the exhibitions you mount: their topics, their aim, their language, their structure. I’m afraid your predecessor was often a dreadful exhibition-maker. Some of the worst I have seen were her doing. Time after time, useful scholarship was replaced by trendy and irritating cultural criticism. Show after show felt more like a polytechnic seminar than an art exhibition. Artist & Empire is another example. Like so many recent events at Tate Britain, this extended wrist-slap about Britain’s imperial legacy left me gasping for the pure and exciting intoxications of art. From the caption outside, which welcomes visitors to the show by insisting that “empire” is “a highly provocative term”, and that the “imperial narratives” examined in the exhibition have influenced “social structures, culture and the fault lines of contemporary global politics”, this is a prissy and off-putting event. I’ve never been an art-for-art’s-sake type of critic — I, too, believe in the importance of contexts — but do we really need this much documentation and this little artistic glow? Apart from transferring the caption writer here to a job at the Ministry of Second-Hand Sociology, and imposing a ban on the use of “practice” and “narratives” in your wall texts, what you need to do in your shows, Alex, is remember that art is something you want to see, not read about. As Francis Bacon so rightly put it, art circumnavigates the brain and appeals directly to the senses. So here’s the secret of great exhibition-making. Round up lots of great art. Put it in the right order. That’s it. Anyway, welcome to the job. Your task is a fabulous one. Enjoy it. « Is this a £100m Leonardo or Sally from the Bolton Co-op?